The greatest Netherlandish painter of the second half of the 15th century, Hugo van der Goes lived in Bruxelles from ca. 1436 and 1482, the year of his death. 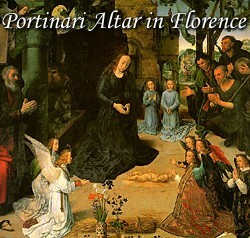 He had numerous commissions from the town of Ghent for work of a temporary nature such as processional banners, and in 1475 he became dean of the painters' guild. In the same year he entered a priory near Brussels as a lay-brother, but he continued to paint and also to travel. Mrs. Mary Elizabeth Podles is former curator of Renaissance and Baroque Art at the Walters Gallery in Baltimore. She holds her undergraduate degree from Wellesley College and graduate degree from Columbia University in Art History. Her additional professional positions include Sotheby’s, the Metropolitan Museum of Art and the National Gallery.